Keiko Eto Fore was born on September 3, 1933 in Taketa Japan and died on June 12, 2018 in Laurinburg N.C. She was the daughter of Keiichi and Fujiko Eto. She is preceded in death by her husband James C. Fore, son Michael Fore and grandson Christopher Fore. 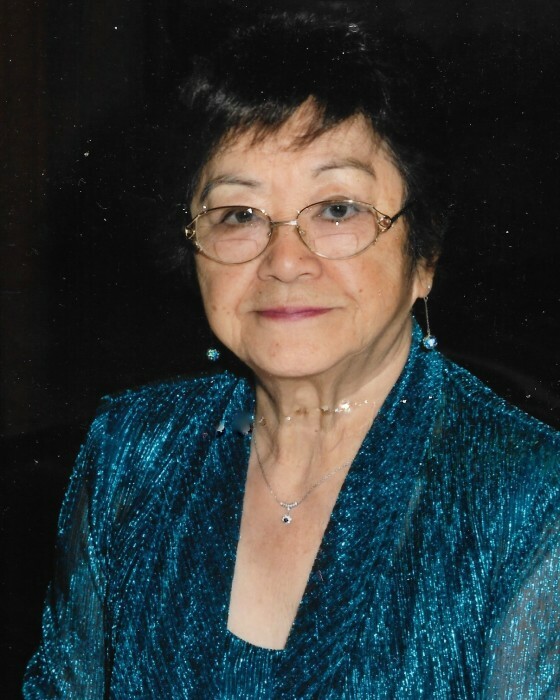 She is survived by seven children Nami Ohtani (Stuomo), Cathrene Grand (David), Julius Fore (Tamara), Susan Roberts (Tom), Glenn Fore (Susan), Kenny Fore (Susan), and Chris Fore (Jennifer), 17 grandchildren and 20 great grandchildren. Keiko was a Hiroshima atomic bomb survivor as well as a patriotic American. Keiko came to the United States in 1954 and devoted herself to her family and eventually to the community in which she raised them. From her time at McNair’s Department Store as a seamstress she built her name on the quality, specialty work she did. Later in her own private business, she became known for her work with wedding dresses. So many young ladies entrusted the most important day of their lives to her talented and capable hands. That same care was then devoted to the Scotland High School Marching band repairing countless aging kilts, jackets and socks. Friday nights in the fall you would find her at all of the Scotland High School football games, home and away, cheering on her Fighting Scots. She cared deeply for her family and showed as much in the care and love she took in preparing a Sunday meal or special Japanese dinner. Everything she cooked was seasoned with heart and soul and mostly love. Keiko lived with grace and dignity that belied her strength. She was kind and patient and strong willed and talented. And beautiful. She was always beautiful. She was the sun that her family revolved around, ever fixed by her gravity. Her star rose in the East and now sets in the West and we, her family, are left to remember her, tell her story and carry on her legacy of family, food, community and most of all, love. A memorial service will be 10:00 a.m. Saturday, June 16, 2018 at Old Laurel Hill Presbyterian Church, officiated by the Rev. Deck Guess and Rev. Howard Whitehurst. Burial will follow the service at Spring Hill Cemetery in Wagram. Visitation will be 4:30 – 6:30 p.m., Friday, June 15, 2018 at McDougald Funeral Home and Crematorium. In lieu of flowers, memorials may be sent to Old Laurel Hill Presbyterian Church Kitchen Fund, 15301 McFarland Rd., Laurinburg, N.C. 28352.